From outdoor and pet-friendly digital motion detectors to analogue motion detectors, the Paradox series of motion detectors combines advanced features and patented technologies to provide a high level of detection and false alarm prevention. Whatever the application, there’s a Paradox motion detector that will suit your needs and surpass your expectations. Developed for high-security applications, our digital motion detectors perform direct analog to digital conversion of the PIR sensor’s signal using a powerful, high-speed microprocessor-based digital IC. A software-driven process then converts, amplifies and processes the sensor’s low-level signal in the digital domain without any analog circuitry (no saturation, no loss of data and no noise). This unique technology provides increased accuracy, reliability and superior false alarm immunity. Conventional “digital” motion detectors have an analog stage that is used to amplify the sensor’s signal. The analog circuitry causes most of the signal to be lost due to the saturation of the amplifier. Therefore, there is no real benefit in adding a processor to an analog motion detector since most of the signal is lost in the amplifier stage and there is no data to process over a conventional analog decision-making circuit. Auto Pulse Signal Processing (APSP) measures energy from each detected signal and stores it in memory. To generate an alarm, the memory must reach a required minimum level. Thus, in the presence of high-level signals (very low risk of false alarms) the detector immediately generates an alarm, functioning as a “non-pulse count” detector, while low level signals (presenting a high risk of false alarms) will cause the detector to automatically switch to a very high pulse count mode – resulting in excellent protection against false alarms. 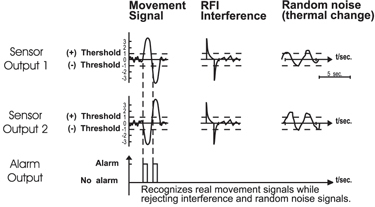 Pulse counting rate depends on signal energy levels and can go much higher for RFI signals. FEATURES: 100meter range outdoor triple-beam infra-red detectors for alarm system. Can link up to existing alarm system or isolated siren. FEATURES: Outdoor Invisiable MW barrier wall, detection range up to 150meter.